Hello everyone. It's a pleasure and an honor to be here. I believe I was already introduced, so I will not repeat that. Both Kawamura-san and George have mentioned the ongoing revision of Daisy, so-called Daisy 4 revision, and also the E-PUB standard. 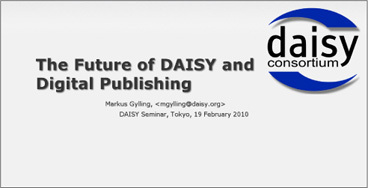 What I will do is to try to go into a little bit more detail about the content of the Daisy 4 revision and the future E-PUB, so that those of you who work in the field of producing accessible content know what to expect 1, 2 and 3 years ahead from now. Let's start talking about the Daisy 4 revision. This revision started in fact already in 2008 when the Daisy Consortium opened up the floor to the world by holding a public requirements gathering. This was a requirements gathering that was completely open to the entire community, and even to organizations that were not, so to speak, part of the Daisy community. We wanted to gather from actual organizations and users all the information we could about what users and producers want to see in the future on Daisy. It became evident that even if many organizations and users are happy with Daisy as it is today, they want more, much more. When we looked at the requirements that came in from the public, we noticed that there was a pattern in the requirements that came in, the requests that came in. They were related to two distinct areas of the Daisy ecosystem. One area was that of production. Those organizations that produce accessible content had a certain set of new features and functionalities that they wanted to see. The other area was that of distribution, or you could call it consumption. When you think about the current end users of Daisy, there are new features that they want. But another very interesting aspect in terms of end users is that there are disability groups who can almost use Daisy today, but they can't go the full way. There are certain features missing in Daisy that if added would allow entire new user groups to start using this format. So in terms of production, this concept has already been mentioned, most requests were about the XML master production concept. This is where you have one XML document from which you can produce Daisy books, E-TEXT, Braille, and large print and more, PDF for example. This is a concept that has been available in Daisy, especially in the Daisy 3 standard. We have learned a lot over the last decade by using Daisy 3, and we realized that now is the time to take the next step in Daisy 4, and make this idea of the XML master production bloom out fully. As many of you probably know, one of the most complex and challenging aspects of this is to be able to produce good Braille from XML. Regarding distribution we had requests for adding support for video as a first-class citizen in the Daisy talking book. From the school environment we have requests to support what we call interactive forms. I will talk more about that later, but the idea is to allow educational testing and workbooks to be doable in the Daisy format. Especially interesting, of course, here in Japan, is the necessity to improve the support for RUBY and also vertical text. This is another aspect that is critical to get right. So, the Daisy 4 specifications based on our analysis of the requirements that came in from the public will be divided into two distinct separate specifications. One of these will deal only with authoring or production. This is the single XML document format that we are defining. 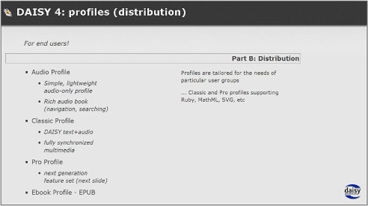 The second part, the distribution part, or consumption part, deals only with the end user formats. 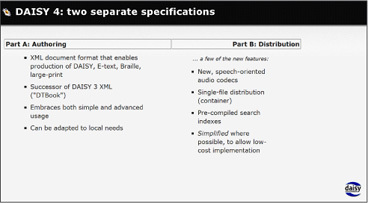 I will show you a bit more about it soon, but as an overview, a few of the things that happen in the Daisy Part B, distribution part, just a few examples of new features, we're adding new speech-oriented audio codex to the supported list of audio file formats, so that you can have better audio quality with a smaller file size. We're adding a single file distribution format, so that you can ship your Daisy books on one single archive. This is especially interesting when you are using the Web to get the content to be used. We're adding support of search indexes that are precompiled at production time. This can be used as well with audio-only books. So if you're looking for a particular word in an audio book, you can actually search for it. We're also trying to simplify Daisy as much as possible to allow the low cost implementation of Daisy reading devices. In both Part A and Part B, we're trying to embrace, and this is a challenge, we're trying to embrace what is a very diverse user community. We have very diverse production environments. Remember that Daisy is being produced in developing countries by organizations that are by definition very poor and have very limited resources. Daisy is also being used in the developed world where there are organizations that actually have a lot funds. So the challenge is to be able to embrace this entire diversity by adapting to both the simplicity of some organizations and the more advanced use of others. A brief word about the authoring production format. Daisy so far has been book-centric. The Daisy 3 XML format was book-centric. And as you know it is called a digital talking book. This book-centrism is not going away, but we are also embracing other types of content than the book. This is especially important in the authoring content, in the archival context as well. So what happens when what you want to publish is not a book, but a magazine or a journal or a letter? We need to be able to represent in an XML format all these different types. For this purpose we use what we call profiles, with each profile focusing on a particular type of content. And there is also the ability to adapt these profiles to suit the specific needs of a specific organization. So let's assume, for example, that here in Japan, in order to be able to produce Japanese Braille from these XML files, let's say you have a specific need regarding line breaks, because you cannot break lines given particular Japanese characters, you would be able to append this information to these documents using an extension of your own. In these profiles, and these are technical terms here, we're also making use of existing standards wherever possible. It is like the holiest law in the religion of Daisy not to reinvent what others have already done. Mathematics is becoming increasingly important to support as Daisy is being used in higher education. Daisy 3 has spearheaded the use of mathematics and, of course, we are carrying on with that. Scalable Vector Graphics, SVG, to make images and graphs increasingly accessible is being integrated. Support for speech synthesizer pronunciation instructions is being added. RUBY, as I have already mentioned, is being made a first-class citizen. 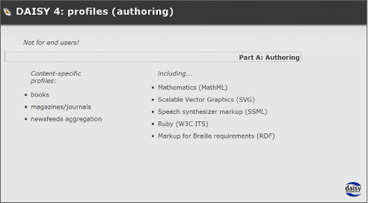 And similarly, regarding Braille production, the most challenging part of it, we are using the Resource Description Framework, RDF, in order to allow proper Braille requirements to be covered by the authoring format. In summary, several profiles with the possibility of doing a very rich content markup if you need to; the point here is that you don't need to use these advanced features for your format. You can just skip it. Okay, distribution, the consumable Daisy products. What we're doing here is also to use the concept of profiles. Again, it's a very diverse user community. Users with very diverse needs, all from the simple leisure audio book to the professor at the university who needs to read highly complex Daisy content with mathematics, SVG, science. If we were to cover all of these diverse needs in one single format, it would be very, very complex. So we are using profiles to allow the user and the producer and the tool providers to focus on a particular aspect of Daisy. There will be what we call an audio profile, which is a simplified version of the current Daisy, simpler than the current Daisy is, in order to enable, especially then, leisure reading on low cost devices. It's challenging today for our tool providers to make their tools cheap enough. So we want to help the vendors and tool providers to be able to reduce their costs. There is the second profile of four that we may end up calling the Classic profile, these are tentative names. It resembles a lot of how Daisy looks today, with audio and synchronized text with images. But with a lot of enhancements and bug fixes, so obviously for example, RUBY will be supported here. Where the big new revolutionary things happen, however, are in the two following profiles. We have a profile that we may call the PRO profile. PRO stands for professional. It's not a good name, so I hope it will be changed before we're done. This is the next-generation Daisy profile. This is where the revolutionary features are added. And the next slide will show you a bit about that. Fourth, we have the E-BOOK profile, the text-only profile that George mentioned, where we intend to use the industry, the commercial E-PUB standard as our distribution format. Back to the PRO profile, the revolutionary one. User groups, disability groups, have been for the last decade standing on the threshold of the Daisy format, asking us to accommodate their needs. People with hearing impairments, cognitive impairments are two examples. As Greg mention, the dyslexia population is also very varied. Images and moving images are a very important means of conveying information to these groups. 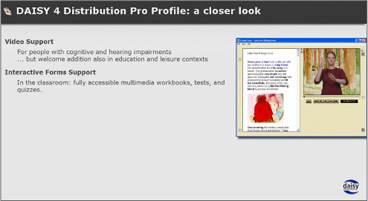 The PRO profile will support video inside Daisy book. This is very different from a video on the Web. If you go to You-Tube, there is this page and there is a video and a play button, What Daisy will do with video is very much different from that. Video will be integrated into the Daisy book in a fully synchronized, multimedia way. There is a picture on the screen that shows a video with a human sign language interpreter. On the left part beside this video is the text of the book and the images of the book when the sign language and the text are synchronized with each other. For those who know, Daisy recognized this concept synchronization and suddenly video is part of it. The other major feature then, the revolutionary feature, is the interactive forms, as I mentioned. From K12 up to university, the ability to do tests, the ability to do what's called workbooks where students need to enter information. These things have not been covered yet, and I would say that it is an obvious aspect of civilized society to provide the ability for everyone to be able to do tests and other interactive engagements in an accessible way. So these are the two major new features of the profile. Regarding E-BOOKS then, text-only aspect of Daisy, as some of you may know, Daisy 2 and Daisy 3 have supported the text-only format, but we see, as George mentioned, a tremendous opportunity now to harmonize with the mainstream. Basically, stop providing our own version of text-only, but instead use E-PUB. The question of course becomes, well then, is E-PUB accessible? And that is a long question, and as I only have 20 minutes instead of 20 hours, I'll only be able to skim over it. The good news is that Daisy E-PUB is already collaborating. 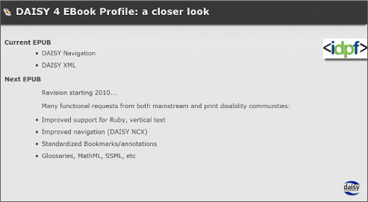 E-PUB 2.0, which is the current version, already supports the Daisy Navigation and the Daisy XML. There is a revision starting this year of E-PUB to produce what we'll call E-PUB 3.0 probably. Where Daisy will participate in every single breath taken with that revision, we will be a part of that breath to make sure that accessibility requirements and internationalization requirements are met in the next E-PUB standard. E-PUB today has problems with RUBY and vertical text, an obvious thing we will address in the next revision. And the same thing for continued accessibility for as many people possible. Summary. During this year, and ending next year, there are two parallel revisions going on. Daisy 4 is one them and E-PUB 3 is the other. If the harmonization of these two standards is successful, and it looks very much like it will be, it will be one of the most major changes to the accessible domain in a long, long time because it merges the mainstream and the accessibility formats with each other. What Daisy provides is rich, synchronized multimedia. This is important to remember. It's what distinguished Daisy from E-PUB. E-PUB is text-only, and Daisy will be adopting it as our text-only program. 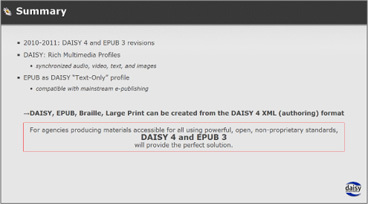 One of the major aspirations or targets for the Daisy 4 revision is to make the Daisy 4 XML authoring format the next generation of Daisy XML rich enough so that it can be used to produce Daisy, E-PUB, Braille and large print from one single file. Possibly fully automated. So once you have this file, there is essentially no cost to produce a large variety of output formats from that file, and Romain will be talking more about this in his presentation. So we believe that if you represent an organization that is charged to produce accessible content for all, using open, nonproprietary standards, the combination of Daisy 4 and E-PUB 3 will be a really good solution for you. Thank you.